The second edition is out, swollen from 223 pages to a tumescent 295 pages! The multimedia chapter has added information on <track>, getUserMedia, webRTC. There's even more detail about how to get more out of geolocation; more storage methods and techniques, including the new IndexedDB storage API; we now have full examples on how to use Server Sent Events, and updated detail on offline applications, gotchas and debugging tips. There's a brand new full chapter on polyfills, what they are, how they work and how to use them! 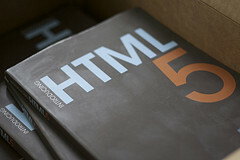 We’re not one of the HTML 5 spec writers, and we’re not here to persuade you to use it. Our take is that it’s going to happen, so we need to get acquainted. But we’re going to point out (perhaps rant) about the good parts as well as the bad. It’s as far as possible a practical book, showing you how to use the language but some areas of the spec will be discussed theoretically as they’re not yet implemented anywhere. Errata notice: If you spot any simple typos, please email errata@peachpit.com. If you find a content error, please mail authors@introducinghtml5.com.